Becky Dutro is a 30-year resident of Las Vegas who has lived in almost every corner of the valley. 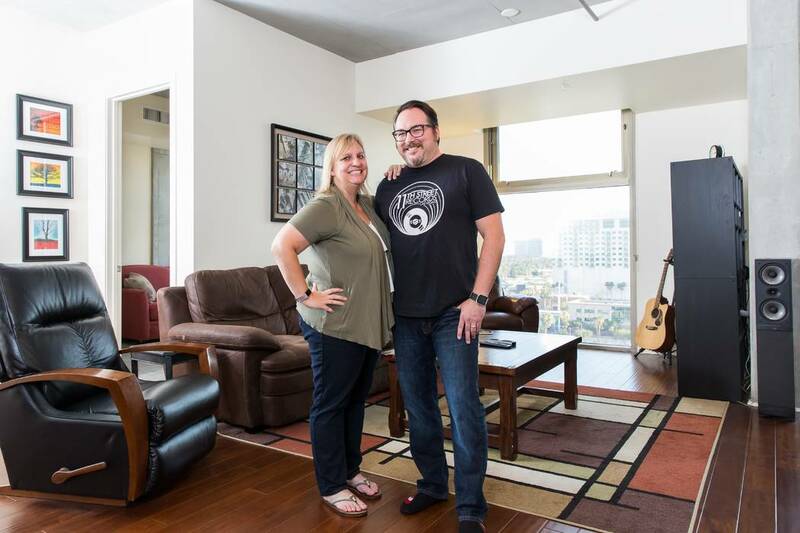 For the past several years, downtown Las Vegas has been her neighborhood of choice, and in March, she and husband Lahm purchased their dream home at Juhl, a loft-style community known for its flexible floor plans and industrial chic design aesthetic. The Dutros gravitated to Juhl because they recognized the property owner, DK Las Vegas, was committed to creating a strong sense of community. They also appreciated Juhl’s thoughtful and chic urban design and abundant resident amenities such as a movie theater, resort-style pool with cabanas, spa, fire pit and vino deck. Add to that onsite concierge and security teams, and the Dutros were sold on both the lifestyle and all that Juhl offers. Self-proclaimed foodies, the Dutros frequently visit their favorite hot spots at The Promenade at Juhl, including Le Pho, Greens and Proteins and Classic Jewel cocktail lounge, all on the ground floor of Juhl. Other top downtown destinations for the couple include The Kitchen at Atomic, Rock ‘N’ oodles and Cornish Pasty. “We travel a lot, so it’s comforting to be able to shut our front door and walk away, knowing our home is in good hands while we are out of town,” Lahm said. “We enjoy breathtaking views of the mountains and the Strip from our balcony. And our family loves to visit because they know when they stay with us, they can enjoy a unique Las Vegas experience, all within walking distance of our home,” Becky said. Juhl, which spans an entire city block in downtown Las Vegas, recently issued a call to Nevada artists to apply for its Artist in Residence program, offering the best of work and home under one roof and creating a sense of culture by encouraging creativity and artistic exploration. Juhl is an urban destination and a popular residential choice for professionals and entrepreneurs, especially many who work at firms and courthouses throughout downtown’s expansive legal community. Juhl encompasses multiple buildings, including a high-rise, mid-rise, brownstones, live/work spaces, retail spaces and a warehouse-style loft building. Many of its residences can be customized via 130 unique floor plan configurations, including many that are one-of-a-kind within the property. Homes at Juhl range from 600 to just under 2,000 square feet and start in the high $100,000s. Recently remodeled, Juhl boasts an upgraded resort-style pool with cabanas, lobby and co-op working spaces that cater to its professional residents. Hallmarks of Juhl include flexible floor plans, large terraces and floor-to-ceiling windows that maximize natural light. Private balconies, 10-foot ceilings, energy-efficient design and details, exposed concrete surfaces and mechanicals and upgraded fixtures and surfaces combine to create Juhl’s cool, urban vibe. Amenities include an al fresco movie theater; two-story fitness center with pool and Strip views; 10th-floor vino deck with Strip views; resort-style pool with cabanas, spa and fire pit; 24-hour security; gated parking structure with assigned resident parking; and full-service concierge. A summer kitchen, called “Canvas Grill,” is the perfect spot for warm-weather entertaining. And a nearby Urban Garden plot exclusively for use by Juhl residents makes it possible to grow fresh herbs and vegetables in the heart of the city.